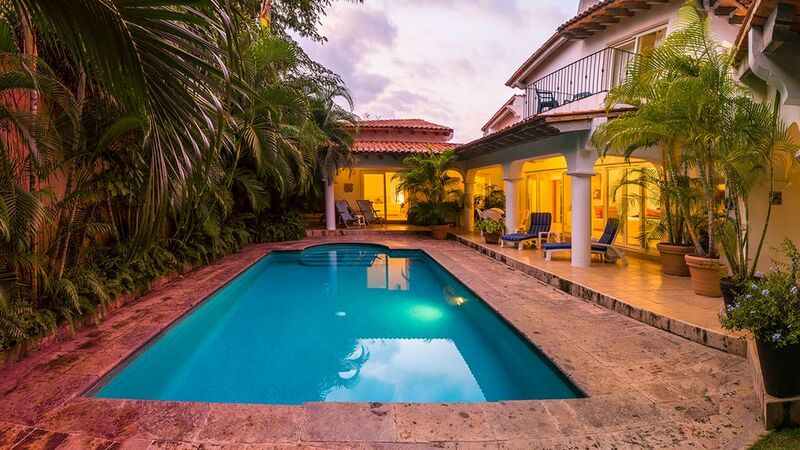 This contemporary villa with with extensive windows and glass doors is built around pool and lush, tropical garden. One great room with soaring ceiling includes living room, dining room, kitchen and entry way where family and friends can comfortably gather. A spacious covered terrace provides additional eating and lounging areas. This property is completely private, and very romantic. Each bedroom has its own private terrace. There is a master suite with king size bed and marble bath on the first floor. A second bedroom on the first floor has two single beds (which can be converted to one king size bed) and private bath along with a 3rd spare bedroom with a queen bed on the main floor. Additionally, there is a romantic second master suite with queen size bed and private bath on the second floor. The third floor terrace has sweeping views of mountains and ocean. Our villa is only three short blocks to famous white sand beaches for which Bucerias is famous. My sister and I live and raise our children in Denver Colorado. Our late parents built the home with care and love in 2000 and my sister and I have been managing the home since 2004. This is a home to rest, relax and enjoy friends and family! Private home with private pool. 2.5 walking blocks from the ocean. Twice weekly maid service, gardener & pool maintenance weekly. WIFI IN THE HOME. World Class Restaurants, whale watching, bird watching, paddle boarding, surfing, Sea kayaking, golf, yoga, deep sea-fishing, tennis, water sports and much much more!